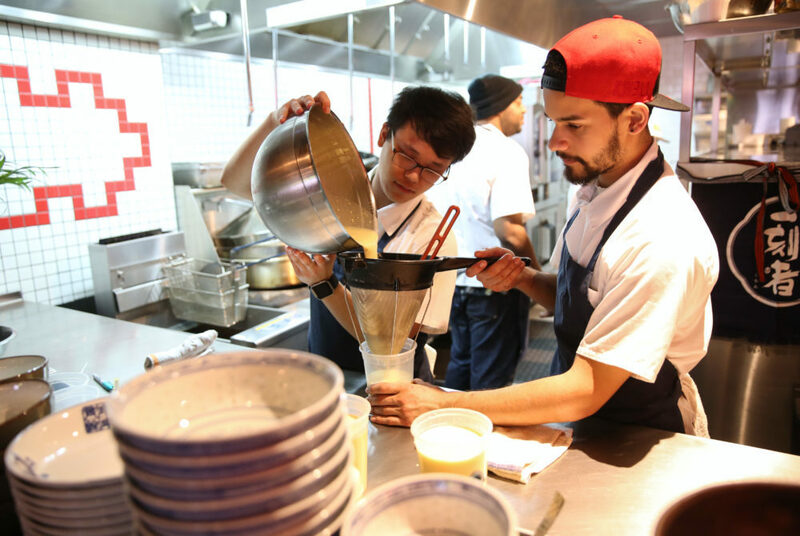 Tiger Fork, a new restaurant that brings Hong Kong flavors to D.C., serves up Beef Chow Foon. In Chinese culture, the number eight is considered lucky. Peering into the eight-sided window at the new Tiger Fork restaurant, which opened last month at 922 N St. NW, diners will feel lucky knowing they’re going to enjoy upscale Chinese food in a sleek, yet relaxed, space. The restaurant’s airy layout makes for an open and inviting atmosphere, from the picnic-style benches in the middle of the dining room to the open kitchen from which sizzles and smells escape. Despite the open kitchen at the back of the restaurant providing an interesting show, your eye will be drawn to the fascinating fusion of farm-to-table hipster and traditional Asian decor. Throughout the restaurant, milk bottle water jugs and scuffed wooden tables stand alongside hanging Chinese lanterns and Chinese dragon graffiti. Once the food got to the table, it did not dazzle me as much as the restaurant’s chic but relaxed vibe. The food is on the expensive side with main courses costing about $30 and small plates costing about $15, and the taste does not meet the expectations set by the price tags. Most of the menu consists of small plates that are the perfect size for sharing with a group of friends. I sampled the sour potatoes ($6) – a mix of thin-cut french fries, pickled potatoes and cilantro. This dish is a Western twist on traditional Chinese hot and sour potatoes. The dish had an opposing texture from the mix of crispy fries and softer pickled potatoes, but the vinegar flavor was so strong that I couldn’t even taste the cilantro, a spice that I would usually notice. I also tried two of the main courses, the Chinese cauliflower, which consisted of cauliflower and flowering chives tossed with soy sauce, ($14) and beef chow foon, stir-fried wide rice noodles and thin-cut pieces of beef ($18). Our friendly and attentive waiter explained that the beef for the noodle dish was a brisket that aged for six months, but the beef was surprisingly dry and chewy rather than tender like I had expected. The rice noodles were the perfect chewy consistency, but the beef did not live up to the hype. A sea of chives accented the cauliflower main event, which, at first glance, looked like a typical stir fry you could make at home. From the first crunchy bite, the golden cauliflower and greens dish exploded with a rich umami flavor from a tasty mushroom soy sauce. But after a while, the richness was overwhelming and begged for something fresh and raw to cut the dish’s saltiness. The Chinese tradition doesn’t stop at the food. Tiger Fork offers several hot teas, like chrysanthemum and tung ting oolong, that are either served in a cup or an ornamental copper pot, as well as house sodas and a Hong Kong milk tea. The cold milk tea ($3) had the sweet taste of bubble tea but was a bit more flowery. The tea is served in a slender glass with ice instead of the tapioca pearls that give bubble tea its bubbles. It was a welcome, refreshing break from the meal’s intense flavors. At the octagon-shaped bar, another nod to the Chinese lucky number, bartenders use a popular Asian grain liquor, baijiu, in some of their cocktails. Some cocktails are tea-infused, and all of them mirror traditional Chinese medicine because Tiger Fork hired a Chinese medicine consultant to help craft the drinks. If you’re looking for gourmet cuisine or Chinese takeout, stick with your tried and true favorites instead of going to Tiger Fork. But for an evening that feels thousands of miles away with a wide selection of teas and dressed-up Chinese small plates to nibble on, the trip to Blagden Alley is worth it.